The man accused of strangling defrocked priest John J. Geoghan in prison was serving a life sentence for a similar act: He strangled an older man in what veteran investigators yesterday called one of the most brutal crimes they had ever seen. In that 1988 case, Joseph L. Druce, who was known then as Darrin E. Smiledge, attacked and killed a man who had picked him up hitchhiking. Smiledge punched and kicked his victim until the man was near death, then tied him up with rope and threw him unconscious into the trunk of the man's own car before driving to a wooded area in Beverly, police said. The victim, George Rollo, a bus driver from Gloucester, awoke as they drove, barely clinging to life and pleading from the trunk not to be killed, said Gloucester Police Lieutenant Joseph Aiello, who investigated the case. Smiledge stopped near the North Shore Music Theatre in Beverly, where he dragged Rollo to some woods, untied him, and made him strip naked. He then led Rollo to believe he would be freed before using the rope to strangle him, Aiello said. A witness described the details to police. "He was definitely one of the most vicious murderers I've ever seen," said Aiello, a police officer since 1977 who arrested Smiledge in his room in a Gloucester boarding house shortly after Rollo's murder. "He was just a savage, savage person." Smiledge was convicted of Rollo's murder and was sentenced to a life term at the Souza-Baranowski Correctional Center in Lancaster. For an unknown reason, he changed his name to Joseph L. Druce while in prison. It was there, in the protective custody wing, that authorities say Druce strangled Geoghan on Saturday. The defrocked priest was accused of molesting nearly 150 children. His crimes triggered the clergy abuse scandal that has rocked the Catholic Church. The similarities in the two killings are striking. In both cases, Druce, now 37, was about 30 years younger than his alleged victims; Geoghan was 68 when slain, and Rollo was 51 in 1988, when Druce was 22. 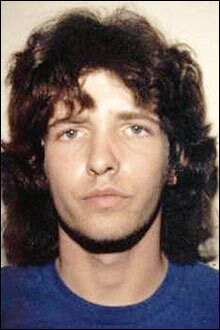 Both victims were strangled, and in both cases, Druce apparently had reason to believe his victim was gay. Geoghan was in jail for fondling a boy in a swimming pool, and many of the 147 people who say Geoghan abused them are male. Druce, who was hitchhiking in Gloucester with another man when Rollo picked them up the night of his death, believed Rollo was gay, Aiello said. "Smiledge viewed it as a gay-bashing," Aiello said. Druce's father, Dana Smiledge of Byfield, said Saturday his son had a longstanding animosity against homosexuals, in addition to a hatred of Jews and blacks. Dana Smiledge could not be reached yesterday to elaborate. Druce also pleaded guilty last year to mailing anthrax hoax letters to 39 lawyers around the country with Jewish-sounding names. Dana Smiledge, who hasn't spoken to his son in eight years, said Saturday that Druce had also threatened to kill his family. Aiello, the Gloucester police lieutenant, said Druce also had sent letters from jail threatening him and the Gloucester police department. John Bianchi, a retired Beverly police detective who was also among those who arrested Smiledge, said he had investigated plenty of rough crimes in 32 years as an officer, but Rollo's murder stands out in gruesome detail: the harsh beating, the panic-stricken ride in the trunk, and finally the deceitful strangulation. "All murders are brutal, but this murder was particularly brutal," he said. During Smiledge's trial in Newburyport, Aiello said, he and Bianchi were so convinced that the defendant would kill again if let free that they walked to a church while the jury deliberated. It was the only time in 26 years of fighting crime that he had ever asked for such divine justice, Aiello said yesterday. A few minutes later, the jury returned with a guilty verdict. "We thought once this guy went to prison his crimes were over," said Aiello. "But apparently we were wrong."